The advantage of doing one of your ancestors’ descending genealogy is that you get to learn about people you would have never heard of precisely because they didn’t have any descendants. Then, why write about them? So many reasons I think. To get the whole picture. To have everyone accounted for. And to learn about history. History and the family history. Charles Tourville is one of those persons. His burial record dated July 19, 1847 (found under the name of Courville) states that he died at age 29 in Montreal and that he was a policeman. I was digging in La Minerve newspaper recently and Charles Tourville came back to my mind. I thought, and what if he died in the line of duty? I was looking up for an entry after July 18, date of his death, and though I couldn’t come up with anything, I kept reading articles about the immigrants, the Sheds, and sick people. A quick check at the dictionary made me realize that 1847 was also the year of the typhus epidemic in Montreal brought by the Irish emigrating to Canada. Unlike the 1832 cholera epidemic, the civil population was not affected by the typhus so much but the immigrants living in the Sheds, the religious community members taking care of them, and the policemen on the front line were victims of it. 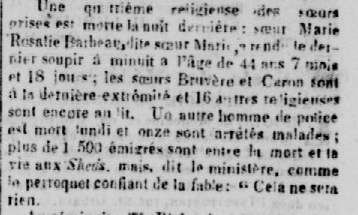 Bibliothèque et Archives nationales du Québec, La Minerve, Thursday, July 22, 1847 — TRANSLATION: A fourth member of the Grey Nuns Congregation died last night. Sister Marie Rosalie Barbeau, known as Sister Marie, passed away at midnight at the age of 44 years, 7 months and 18 days old. Sisters Bruyère and Caron are most likely to die and 16 other nuns are still bedridden. Another policeman died Monday and eleven others are off work owing to illness. More than 1500 immigrants are close to death in the Sheds but as reported by the Ministry confident that all this is nothing but business as usual: “Everything will be fine”. Charles Tourville’s name does not appear in the newspaper but it has to be him. That Charles Courville is surely « our » Charles Tourville as he died only six months after his marriage to Sophie Lemire, dite Marsolais, on January 11, 1847 at Notre-Dame Church of Montreal, and that Sophie gave birth to a son, Charles (hereafter for ease of reference, “Charles Jr.”), on October 30, 1847, in Montreal. The baby is said to be the son of the « late » Charles Tourville, carter of Montreal. When Charles [Jr.] died on January 31, 1849, he is once again identified as the late Charles Tourville’s son, carter of Montreal. At the time of his marriage Charles Tourville was a carter from the parish of Montreal, like his own father. Being born on January 18, 1818 in Mascouche from Charles Tourville and Marie Pauzé, he was indeed 29 years old at the time of his death in 1847. Furthermore, I couldn’t find any Charles Courville born near the date of 1818. A lot of Tourvilles are identified as Courvilles in the church records; sometimes the « T » looks like a « C », sometimes it might be the priest who made a mistake. According to the newspapers, the Montreal Police was recruiting hoping to prevent the spread of the epidemic. Was Charles hired before the disease got out of hand? Was he out of work as a carter? From what I have read, the Police was implemented in the City in 1843. I doubt I can get anything as I am not sure a paper trail still exists. Nonetheless, during my summer vacations, I do plan to go to the Archives of Montréal to see if I can discover anything on policemen working for the city in 1847. I think it’s worth a try. To learn more on the 1847 typhus epidemic, click here and here. Have you ever heard of the well-renowned Montreal’s photographer, William Notman (1826-1891)? Thanks to the McCord Museum Website and its online database, you can take a look at the wonderful portraits taken by this great artist who has welcomed in his studio many famous people of the time. If it hadn’t been for my passion for genealogy, would I have been able to identify “Mrs. R. Forget” as being Alexandra Tourville, wife of Rodolphe Forget? Born in 1863, Alexandra was the daughter of Louis Tourville, co-founder of the Banque d’Hochelaga (known today as Banque Nationale du Canada or National Bank of Canada), and Célina St-Jean. Alexandra was married to Rodolphe Forget on October 12, 1885, in St. Jacques’ Catholic Church, in Montreal. This picture was taken one year after her wedding at the age of 23 years old. In 1889, she gave birth to a daughter, Marguerite Marie-Louise. Alexandra died at age 27 years and 11 months. 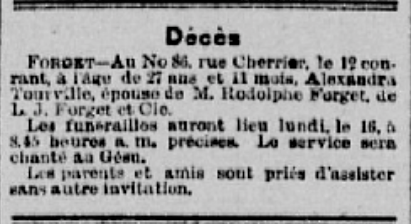 La Minerve, May 14, 1891 – TRANSLATION: Death- FORGET- At 86 Cherrier St. on the 12th, at age 27 years and 11 months, died Alexandra Tourville, wife of Mr. Rodolphe Forget, of L.J. Forget et Cie. The funeral will be held on Monday the 16th, at 8:45 am at the Gesu. Family members and friends are requested to attend. If the name of Rodolphe Forget rings a bell, well he’s the one! He married his second wife Blanche McDonald in 1894. One of their children was Thérèse Forget, more commonly known as Thérèse Casgrain. I thought, what a shame I am not related to that great pioneer of the Women’s rights movement. Well, I was wrong, we are related. Rodolphe Forget’s direct ancestor is the brother of Élisabeth Forget, wife of Augustin Tourville. Aren’t we all cousins?